The Big Five of backcountry repairs: high-thread-count duct tape, needle and thread, stainless steel bailing wire, 1/4-ounce tube of Seam Grip, and thin nylon cord. Archimedes said, “Give me the Big Five and a place to stand, and I will repair the world.” Or was that McGyver? No matter, what’s important is the underlying truism that with a handful of all-star repair items you can fix almost everything. Which is why I chuckle over backpacking repair kits with a hardware store’s supply of doodads like nylon ties, nylon patches, hose clamps, Fastex buckles, Velcro swatches, safety pins, cotter pins, and screws. They’re so… overblown. Instead, with just the Big Five repair items plus a multi-tool (technically a Ten Essential rather than a Big Five), you can repair blown mattresses, ripped tents, broken skis and bindings, delaminated boots, snapped paddles, torn raincoats, clogged stoves, and just about every other piece of equipment toted into the wilderness. For that matter, you can repair just about every broken body part too. Yes, when you leave the hardware store behind, it takes more ingenuity to deal with backcountry emergencies. But as you’re about to see, with duct tape, Seam Grip, nylon cord, bailing wire, and needle and thread you can bind the world—perhaps the Universe itself– together. 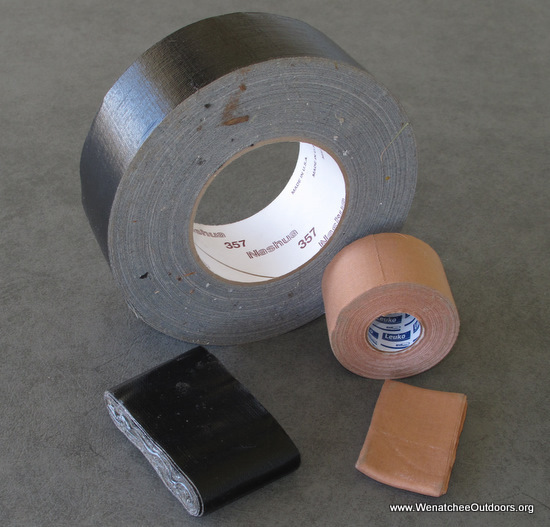 High quality duct tape (the black tape pictured) — keep the large roll at home and pack a small wad of tape rolled over on itself. Leukotape P (the brown tape pictured), made by BSN Medical, is excellent for blister prevention and homemade band-aids and is a worthy addition to the first-aid kit. Splint. Splint most anything (broken fingers, ski poles, paddles, pack frames, broken legs) by spanning the break with something rigid (stick, bailing wire, tent stake, ensolite pad) and anchoring this splint with wraps of tape. Holes. 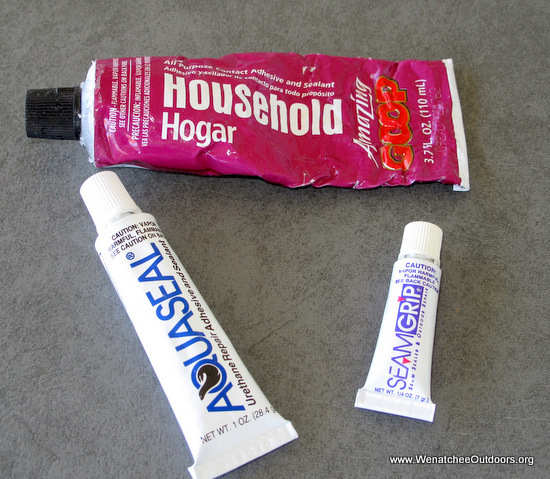 Use squares of tape to patch holes in cups, canoes, canteens, air mattresses…. Clean hole well first, then rub-on tape. When possible, apply tape to both sides of hole. Lost Glasses Strap. With a half-inch-wide, 13-inch-long strip, wrap the ends around the ear bands. Stick the remainder of the tape to itself so as not to snag hair. Lost Sunglasses. Stick two seven-inch strips of tape together, sticky sides together. Cut a notch in the center of this strip for the nose and thin eye slits on either side of the notch. Hold strip against face with a thin band of tape circling the head. Band-Aid. Place folded tissue or TP on a segment of tape; then dress wound. Butterfly Bandage. Cut strip of duct tape into an hourglass shape. With narrow part of bandage over cut, cinch edges of wound together. Unstuck Ski Skins. 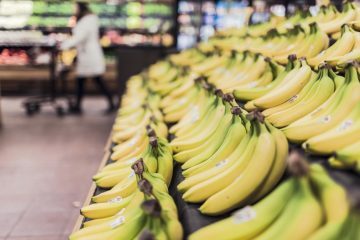 Tear tape into ½-inch wide, 20-inch long strips. Wrap these strips around ski and skins near the tail and waist of ski. Fabric Patch. Patch tears with tape. In critical areas, sew first, then tape. Broken Ski. Overlap the break with the tip portion of the broken ski underlying the tail portion of the ski. Tape the overlap with many wraps. Goop and Shoe Goo are two liquid rubber/plastic solutions worth having at home because they are inexpensive and bond well to fabrics, paper, and porous materials. Aquaseal and SeamGrip are the gold standard when it comes to obtaining a good bond on slicker surfaces. The 1/4-ounce tubes of SeamGrip are recommended for carrying into the field. Delaminated Boot Soles. Clean well; spread Seam Grip between sole and midsole. Wrap boot with duct tape during curing (complete cure requires about 12 hours). Hole in Therma-a-Rest. Deflate mattress and dab Seam Grip over hole. The deflated mattress will draw air into mattress through hole and pull in adhesive for a better fix. Hole in Toe Box (boots, shoes). Dam inside of hole with tape. Apply a reservoir of Seam Grip to hole. Position boot so adhesive doesn’t run. Abraded/Torn Gloves (shells, liners). Reinforce all weaknesses, tears, or holes with dabs or smears of Seam Grip. Leaky Boot Seam/Welt. Clean seam/welt well, coat with thin layer of Seam Grip, and rub in with finger. Apply another layer of material over seam/welt. Leaking Boot/Shoe Upper. Create a waterproof rand around the bottom inch of leaky boots/shoes. Clean upper well. To create a masking line, lay tape around the perimeter of the boot one inch above the sole. Spread a thick layer of adhesive on the upper between the sole and the tape. Rub into seams and welt. Leaking Tent or Raincoat Seams. With tent pitched or raincoat spread out, cover leaking seam. Seam Grip cures when it’s wet so worry not about rain. Tear Repair. Use tape or thread to align torn edges of pack, storm wear, tent, sleeping bag…then cover slit with a ¼- to ½-inch-wide streak of Seam Grip. Leaking Whitewater Bag. Find hole or puncture, clean hole, and dab with Seam Grip. Abrasion Repair. Reinforce/recoat wear spots on tents, tarps, backpacks, gloves, gaiters, rain pants… Rub a very thin layer of Seam Grip into the nylon. Note: Reinforced area will be stiffer. Loose Fixtures. Tent pole tips, tarp grommets, ski pole handles, glasses nose pads, sunglass lenses and more can all be glued in place with Seam Grip. Dying Zippers. Rotted fabric matrixes of old zippers can be repaired by rubbing a thin coat of Seam Grip into the fabric. Lock Nut. Dab Seam Grip on any screw or nut that must not loosen, like ski binding screws or crampon adjustment nuts. Hole Repair. Seal holes in tent floors, tarps, rubber boots, fishing waders, bicycle inner tubes, storm wear, stuff sacks, packs, water bladders…. Use a dab over small punctures. For larger holes, dam the backside of the hole with tape, then fill the hole with a reservoir of Seam Grip. Position material so the reservoir will cure without running. No-Sew Seam Repair. Glue unraveling seams by spreading Seam Grip between the layers of the seam as well as over the seam. Use tape to align seam during curing. Non-Slip Surface. If camp booties, glove palms, or Therm-a-Rest tops are too slick, put a pattern of dabs on the offending surface to create texture/grip. Rand Repair (boots). Squirt adhesive between rand and boot. Anchor rand with tape during curing. Lace Repair. Coat end of frayed bootlaces with Seam Grip. Cord Repair. To increase strength and extend life, coat the frays in tent cords, guy lines, or bootlaces. Rebuild Soles. Rebuild worn heels with a large pool of Aquaseal. Use tape dam around perimeter of heel to keep liquid from running during curing. Edge Sealer. Dab the edges of cut nylon to keep fabric from unraveling. Frayed Gaiters. Coat worn areas of gaiters (or gaiter strap) to extend life. Broken Sidewall (telemark binding). Loosen binding screws and slip several two-foot lengths of cord between the bottom of the broken binding and the ski. Tighten down the binding again, step into the binding and use trucker’s hitches to cinch the boot to the remainder of the binding. Broken Shoe Lace/Gaiter Cord. Cut the appropriate length cord and burn ends. Stripped/Enlarged Screw Hole. Pack ¾-inch segment of cord into oversized holes (e.g., ski bindings that have ripped off). Fill hole with Seam Grip, insert screw, tighten. Split Paddle Blade. Use multi-tool awl to drill several holes flanking both sides of the split. Lace up holes like a shoe. Broken Paddle Shaft/Ski Pole. Splint break with branch. Wrap cord (or tape) tightly around splint and shaft. Broken Binding Cable (skis). Replace with cord. Use trucker’s hitch to tighten makeshift cable around boot. Broken Pack Frame (external frame). Splint break with a short branch or tent stake. Anchor splint with cord. Glasses Strap. Replace lost/broken glasses strap with a length of cord. Tape cord to ear band to eliminate ear-irritating knot. Torn Tarp. Use pebble or small stone to roll up torn area into wad. 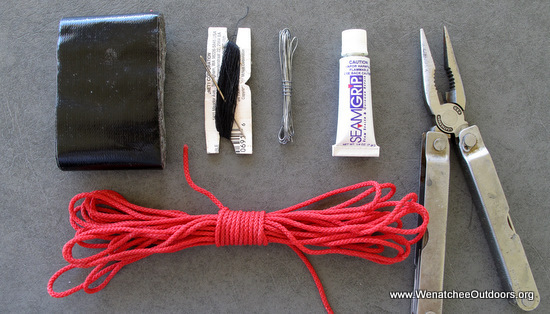 Tie off wad with several wraps of cord and a square knot. Torn Tarp Corner. Use pebble or small stone to roll damaged corner into a small wad. Wrap corner cord around wad and tie off with half hitches. Unstuck/Lost Ski Skin. Impede ski’s glide by wrapping short lengths of cord around ski in several places along its length. Broken Ski Skin (tip attachment). Use a short loop of cord to capture ski tip. Cracked Weld (external-frame pack). Lash the horizontal and vertical elements with cord. Nylon cord and bailing wire. If you can find cord with Kevlar in it (yellow) consider carrying it — it’s strong and light, but more expensive. Also look for stainless steel bailing wire (under the red cord). Compared to normal bailing wire (right) it’s stronger … and it won’t rust. Broken Glasses (nose bridge). Using a 14-inch segment of doubled-over wire, contour the wire along the top of the glasses frame. Make a bend so the wire contours the top of each ear band. Tape nosepiece and ear bands to the wire frame you’ve formed. Broken Glasses (ear band). Similar to above but start your wire splint at the nosepiece and contour along the top of one lens and the broken ear band. Tape wire splint to the nosepiece and several places along the broken ear band. Broken Finger. Immobilize finger with wire splint and tape. Lost/Broken Crampon Screws. Insert a short length of tripled wire through appropriated screw holes. Twist tight with multi-tool pliers. Lost Cotter Pins/Split Rings/Pegs (external frame packs). Insert wire and twist tight. Clogged Stove Nozzle. Tedious but possible: With multi-tool, file wire into an orifice cleaner. Broken Straps. Overlap strap about an inch. Spread Seam Grip on inside surfaces of the overlap, then sew strap together with awl. Tears. Doesn’t matter if they’re in your raingear, sleeping bag, pack, pants, shirt, sock…needle and thread can fix it. If it’s a complicated job, use duct tape on the opposite side to hold materials in place—rip off tape later. To strengthen (or waterproof) patch, use Seam Grip after sewing. Holes. Same as above—repair the hole with a latticework of thread. Duct tape on the back makes aligning the repair easier. Boot Tears. Repair frayed seams and holes with the awl. Then apply Seam Grip. Sunglasses Strap. Lost or ruined strap can be replaced with heavy thread. Attach to ear bands with half hitches. Skinny Splints. For fine jobs—fixing broken sunglasses or fishing rods—thread provides a slimmer means of anchoring splints. A needle and thread is adequate for short trips. For longer trips, consider adding a few stick-on patches (left), a few more needles, and a few pins.